In 1826 Robert Schuyler completed construction on a three-and-a-half story residence in the late Federal style at No. 149 Mercer Street. Faced in Flemish bond red brick, it was similar to other comfortable dwellings appearing on the block between Prince and Houston Streets. It is doubtful that Schuyler and his wife, the former Lucinda Wood, ever lived in the house; but built it as an investment. Born into one of the oldest and wealthiest New York families (Philip Pieterse Schuyler had arrived by 1650), Robert's relatives were the Livingstons, DeLanceys, Van Cortlandts and Van Rensselaers. Nevertheless, the residence was intended for a financially-comfortable family. The entrance, above a shallow porch, was most likely flanked by fluted columns; and above the paneled door would have been a leaded transom, possibly in the form of a fanlight. The stone lintels sat on delightful little paneled blocks and two neat dormers with triangular pediments pierced the peaked roof. The 25-foot wide residence boasted 14 rooms--presumably four each on the main floors and two in the attic. The architect added tiny paneled blocks below the lintels--a handsome touch. By the 1850s the tenor of the neighborhood was drastically changing. Greene Street, one block to the east, had gained the reputation of Manhattan's most notorious red light district. Change would come to No. 149 Mercer Street when its owner died in 1855. The former upscale tone of house and the neighborhood was evidenced when auctioneer William Witters advertised the sale of the residence and its contents, to be held at 10 a.m. on Thursday, April 19 that year. He described "all the genteel household furniture, &c., in the above house--splendid carved rosewood parlor suits, mirrors, centre and side tables, window curtains, elegant carpets &c.; together with the furniture of fourteen rooms, all in good order." According to historian and preservationist Angela Serratore in her 2013 thesis "A Preservationist's Guide to the Harems, Seraglios, and Houses of Love of Manhattan: The 19th Century New York City Brothel in Two Neighborhoods," No. 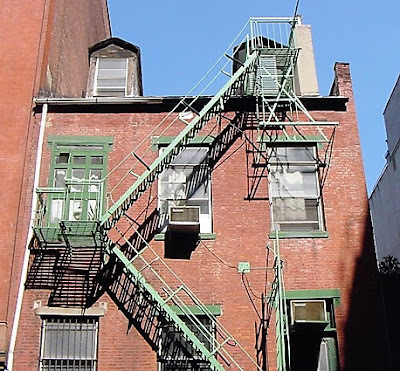 149 Mercer Street became the brothel run by "Mrs. Van Ness." Apparently Mrs. Van Ness operated in the house at least until 1859. On June 27, 1862 it was offered "To let, at a low rent, with immediate possession." The advertisement in The New York Herald boasted a "large yard, &c.; two entrances; one room convenient for a bar." Madame Bell picked up where Mrs. Van Ness had left off. Her name was brought up in court on February 17, 1864 when Sara R. Melville sued her husband, Henry, for divorce. The couple has been married in February 1858; but Henry soon drifted. The New York Times reported that Sara alleged he "has been in the habit of visiting a house of ill-fame at No. 149 Mercer-street, in this City, where he had committed various acts of adultery with one Mme. Bell and others." Because Henry denied the charges, the scandalous details were aired in open court. Readers of The Times could only speculate, however. The newspaper said "the evidence is unfit for publication." The Melville trial was not the first time the brothel had made the news. A year earlier, on October 24, 1863 The New York Herald reported that a client had been robbed. The newspaper used a nearly-comical euphemism to avoid saying outright that the victim was visiting a prostitute. "James McClusky complained, before Justice Kelly, that while taking a peep at the elephant, in No. 149 Mercer street, on Thursday evening, he was relieved of his gold watch and chain, valued at $85. He had grave suspicions as to the honesty of one of the lady boarders named Margaret J. Murphy." Margaret had most likely felt secure in her crime. Few victims reported such thefts for fear of the public scandal that would follow. But she had lifted a rather pricey watch, the value of which would be around $1,675 today. The Sun reported "The magistrate thought Margaret's movements smacked of dishonesty, and committed her for trial in default of $500 bail." Prostitutes and scandals seem to have left No. 149 Mercer Street by 1871 when it was being operated as a boarding house. On July 10 that year the proprietor advertised for "A good cook, middle aged woman preferred, for a private boarding house; will get a good home and liberal salary." The venture was apparently short-lived. On December 13 that year and auction was held, selling "the entire elegant, costly Furniture of a three story house, consisting of Velvet and Brusels Carpets, Parlor Suits, Bedsteads, Bedding, Hair Mattresses, Mirrors, &c."
It was the end of the line for No. 149 Mercer Street as a residential property. C. Weisenstein was selling "saloon fixtures" here by 1876. And in 1880 three businesses filled the former house. Albert and Gustave Herzig operated their furrier business here. Possibly father and son, they both lived at No. 309 East 56th Street. The artificial flower making shop of Aline Lauretzi was on the second floor; and the clothing firm of Kolasky & Pottitzer occupied the main floor. Abram and August Pottitzer, and their partner Fred Kolasky, sold hats, pants and "pantaloons." It was most likely Kolasky & Pottizer who placed an advertisement that year for "experienced hands wanted on bead work; good pay." Aline Lauretzi was hiring at the same time. On September 7, 1880 an ad read "Artificial Flowers--Wanted, a young man who understands cutting and starching." Five months later an advertisement in The Sun sought "Good hands on roses, buds, blossom; work given out; good wages." The mention of "work given out" referred to the practice of workers--normally women--who did piece work in their homes. A change in tenants came by 1885 when H. Schoenfeld and S. Schoenfeld sold "millinery fixtures" here; and M. Feigel & Bro. operated from the basement and lower floors. Originally M. Feigel & Bro. dealt in paints and oils used for building purposes--coloring mortar, for example. Before long the firm branched out, importing and manufacturing "colors, dye-stuffs, varnishes, bleaching agents" and other chemicals necessary in the production of hats. The Millinery Trade Review mentioned in January 1889 "They have all the dyes, chemicals, colors, anilines, alcohols, acids, salts varnishes, etc., etc., needed and used by manufacturers of straw goods, feathers, and flowers. The combustible stock caught fire in September 1887, and again two months later. This time it caused a near panic along Mercer Street. On November 5 The New York Times reported "A fire broke out at 6 o'clock last evening in the cellar of the building 149 Mercer-street, occupied by Feigel & Brother, dealers in oils, paints, and varnishes. It was caused by the ignition of benzine,, and a cloud of dense smoke rushed out into the street." Next door was the feather factory of J. Weill & Co., where 50 young women were working; and the furrier shop of Lyon Brothers where another 100 were at work. "When the girls heard of the fire and saw the smoke they imagined that the buildings where they are employed were on fire and they became panic-stricken and rushed for the stairs." Supervisors reassured the women that there was no danger and sent them back to their places. A bizarre incident involving the theft of six barrels of oil from M. Feigel & Bro. occurred in December 1889. By an amazing fluke, a Feigel employee was passing by the home of Union Hill, New Jersey Councilman Daniel Sturm and noticed the politician with two of the barrels. He notified police and Sturm was arrested. The councilman's alibi was suspicious. The Times wrote "Mr. Sturm says that he received the barrels innocently. His wife gave a stranger permission to leave the oil under his shed." According to him, she he found out about it, he "immediately started to roll the barrels into the street." That was when he was spotted. No. 149 was owned at the time by Louise E. Monnot, who had inherited it from George Ponsot. Like George, who lived in Paris, Louise was an absentee landlord, residing in London. Her attorneys, the Coudert Brothers, managed the property. M. Feigel & Bro. was gone from Mercer Street by the turn of the century. By now No. 149 was a stark anachronism, surrounded by tall loft buildings. By 1913 the Forest Box and Lumber Co. had moved into the first floor; and in 1915 the Dorothy Waist Company, run by Max Goldberg, was on an upper story. Goldberg's operation would supply the break into a scandalous arson and theft scheme following a fire on June 25, 1915. When Lieutenant Gibney from the nearby Fire Truck Company 20 responded with his men, he found that the doors to Dorothy Waist Company had already been broken into. After the blaze was extinguished, Goldberg realized that $800 worth of custom silk and $400 worth of cutting machinery were missing. The pattern of the silk was unique; so when it was found in the tailor shop of Simon Lidz on Orchard Street, it was easily identified. According to The Evening World, Lidz "asserts he had for years bought loot from firemen of Truck No. 20 and from those of another company." Two firefighters, John P. S. Ferrick and William Maloney, were indicted on charges of burglary and grand larceny. The pair would break into businesses, steal goods, then set the buildings on fire to hide the crimes. In 1918 the Couderts engaged architect Ellwood Williams to do $1,800 in renovations. It is possibly at this time that a large opening was broken into the first floor wall for the box and lumber company. Two years later the estate of Louise E. Monnot sold the building to its tenant of five years, the Forest Box and Lumber Company. The asking price, $22,500, would be equal to about $266,000 today. The firm changed its name to the Mercer Box and Lumber Company by 1922. It would remain in the building, producing pine boxes like those used for fruit, into the 1960s. The change in Soho from a gritty industrial neighborhood to one of art galleries, artists' lofts and performance venues began in the last quarter of the 20th century. In 1978 No. 149 Mercer Street was converted to "joint living-work quarters for artists;" just one per floor. By 1986 the Ubu Reportory Theatre was using the ground floor; and in 1991 the Bullot Gallery was here, sharing space with After the Rain, a trendy gift shop which opened in December 1989. An opening advertisement said it featured "New York's most extensive collection of kaleidoscopes and optical toys." In 2003 a facade restoration was completed by preservation architects Preserv. The brickwork and dormers were repaired, new period-appropriate wooden windows were installed, and a synthetic slate roof installed. 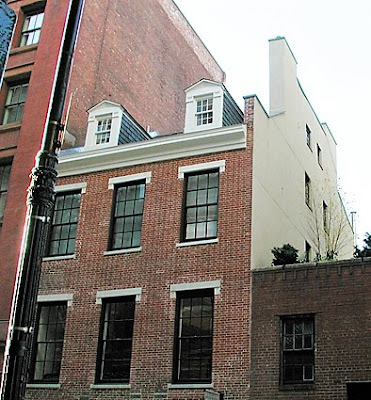 After nearly 200 years the miraculous survivor is a reminder of a time when this stretch of Mercer Street was lined with merchant-class homes; and of a less respectable period when ladies of the night snatched valuables from their unwitting clients.